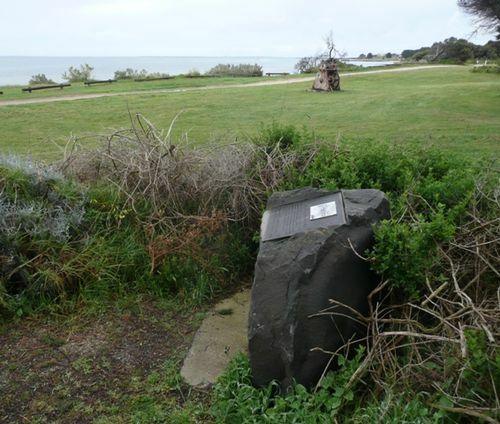 The monument is dedicated to the memory of William Buckley (1780 – 1856) an English convict transported to Australia. He escaped and lived with the Wathaurong people for 32 years. The site of the monument is located near where he returned to European society. William Buckley was convicted at the Sussex Assizes on 2 August 1802 of having received a roll of cloth knowing it to have been stolen, and was sentenced to transportation for life. He was taken to Port Phillip in April 1803 in the Calcutta with a party under Lieutenant-Governor David Collins, and there he and two companions absconded from the camp. Fearful, weary and hungry, they sent signals of distress to the Calcutta from the other side of Port Phillip Bay but these were not noticed. Buckley's friends turned back and were not heard of again. He fed on shellfish and berries, and was befriended by Aboriginals of the Wathaurong tribe, who believed the big white stranger to be a reincarnation of their dead tribal chief. He learnt their language and their customs, and was given a wife, by whom, he said, he had a daughter. For thirty-two years he lived mostly in a hut that he built near the mouth of Bream Creek on the coast of southern Victoria. Wedge, who thought he would be a valuable intermediary, obtained his pardon from Lieutenant-Governor (Sir) George Arthur. John Batman employed him as interpreter at a salary of £50, and he later became government interpreter. But he was confused in his loyalties, and felt that neither the Aboriginals nor the whites trusted him entirely. Unhappy and disillusioned, he left for Hobart in December 1837. He became assistant store-keeper at the Immigrants' Home, and from 1841 to 1850 was gate-keeper at the Female Factory. Buckley died at Hobart on 30 January 1856. Near the site William Buckley returned to European society after having lived for 32 years with the Wathaurong people. He and about 70 members of the Bengalat Clan of the Wathaurong tribe, whose land this was, spent several months in 1835 with John Batman`s men, before the latter moved their settlement to Melbourne. Buckley was a pioneer in cultural understanding. This place of contemplation is dedicated to his memory.